For other uses, see Beluga (disambiguation). "European sturgeon" redirects here. For the species Acipenser sturio, see European sea sturgeon. The common name for the sturgeon, as for the unrelated beluga whale, is derived from the Russian word белый (beliy), meaning "white", probably referring to the extensive pale colour on the underside in beluga compared to other sturgeons. 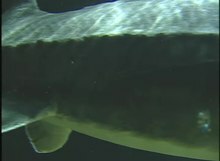 An adult beluga sturgeon swimming in an aquarium. The beluga are a large predator which feeds mostly on fish, also rarely consuming waterfowl and seal pups. The beluga will normally pursue prey in the pelagic zone unlike Acipenser sturgeons which remain more so in brackish areas for foraging, thus the beluga will pursue marine fish. However much prey is also taken in brackish areas such as river herrings, the asp and anchovies. Like most sturgeons, the beluga is anadromous, migrating upstream in rivers to spawn. Males attain sexual maturity at 12-16 years of age, whereas females do so at 16-22 years. In both sexes, they will go to spawn every 4 to 7 years. At one time, beluga sturgeons could migrate up to 1,000 km (620 mi) upriver to spawn but dams in almost every major tributary they utilize has impeded historic spawning routes. The female lays her eggs on gravel from 4 to 40 m (13 to 131 ft) underwater. Upon hatching, the embryo are 11 to 14 mm (0.43 to 0.55 in) long, 10-14 days later when they absorb their yolk sack, the length is 18 to 20 mm (0.71 to 0.79 in). Thereafter, the larvae usually subsist on benthic invertebrates but at as small as 10 cm (3.9 in) in length will switch to a fish-based diet. While swimming back to the ocean, the young sturgeons may cover up to 60 km (37 mi) a day. The largest accepted record is of a female taken in 1827 in the Volga estuary at 1,571 kg (3,463 lb) and 7.2 m (23 ft 7 in). Another specimen reportedly weighed 1,220 kg (2,690 lb) and measured 6.1 m (20 ft 0 in) in length. Several other records of aged sturgeon exceed 5 m (16 ft 5 in). These great sizes mark the beluga as the largest freshwater fish in the world. 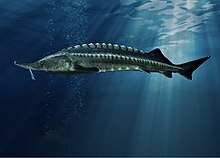 A few other species of sturgeon can attain great sizes but none match the maximum sizes known for the beluga, like Chinese, Pacific White, Oceanic European, Atlantic, Baikalian, and Kaluga, the latter a close cousin which can attain a maximum weight of 1,000 kg (2,200 lb), thus attaining the second largest known sturgeon size. It may be considered as a rival in size to the ocean sunfish among all extant bony fishes, although that passive marine giant has neither been nearly as heavily fished nor takes as long to attain great size, so more regularly attains massive weights. The beluga may be the second longest extant bony fish as well, after the giant oarfish, which is far more slender in build. The Beluga also rivals the great white shark, the Greenland shark, and the tiger shark for the title of largest actively predatory fish, with only the great white easily exceeding the beluga's maximum size. The giant belugas are much larger than the Mekong giant catfish, the arapaima or other sizable rivals for the title of largest freshwater fish. Nevertheless, some scientists still consider the Mekong giant catfish to be the largest true freshwater fish, owing to sturgeons' ability to survive in seawater and that it spends much of its life in brackish environments. Beluga of such great sizes are very old (continuing to grow throughout life) and have become increasingly rare in recent decades due to the heavy fishing of this species. Today, mature belugas that are caught are generally 142–328 cm (4 ft 8 in–10 ft 9 in) long and weigh 19–264 kg (42–582 lb). The female beluga is typically 20% larger than the male. An exceptionally big beluga caught recently reportedly weighed 960 kg (2,120 lb) and measured 3.4 m (11 ft 2 in). 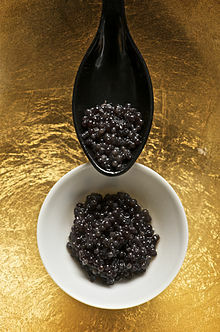 Beluga caviar is considered a delicacy worldwide. The flesh of the beluga, though, is not particularly renowned but is a hearty white meat similar to that of swordfish. Beluga caviar has long been scarce and expensive and its endangered status has made its caviar more expensive in worldwide markets outside of the United States. Its air bladder is said to make the best isinglass. IUCN classifies the beluga as critically endangered. It is a protected species listed in appendix III of the Bern Convention, and its trade is restricted under CITES appendix II. The Mediterranean population is strongly protected under appendix II of the Bern Convention, prohibiting any intentional killing of these fish. The United States Fish and Wildlife Service has banned imports of beluga caviar and other beluga products from the Caspian Sea since October 6, 2005, after listing beluga sturgeon under the U.S. Endangered Species Act. ^ Gesner, J.; Chebanov, M. & Freyhof, J. (2010). "Huso huso". The IUCN Red List of Threatened Species. IUCN. 2010: e.T10269A3187455. doi:10.2305/IUCN.UK.2010-1.RLTS.T10269A3187455.en. Retrieved 10 January 2018. ^ Hochleithner, M. & J. Gessner. (2001). The sturgeons and paddlefishes of the world. Aquatech Publications. 202 pp. ^ Balon, E.K. (1967). Evolution of the Danube ichthyofauna, its recent state and an attempt to predict further changes after the construction of the planned hydroelectric power-stations and diversion schemes. Biologicke prace 13: 1–121, 24 plates. ^ Vecsei, P., Sucui, R., & Peterson, D. (2002). Threatened fishes of the world: Huso huso (Linnaeus, 1758)(Acipenseridae). Environmental Biology of Fishes, 65(3), 363-365. ^ Burton, M., & Burton, R. (2002). International Wildlife Encyclopedia: Index volume (Vol. 22). Marshall Cavendish. ^ "Huso huso". caspianenvironment.org. 2011. Archived from the original on 2012-07-21. ^ "Beluga Caviar". Food Fancy. September 2012. ^ Reynolds, Francis J., ed. (1921). "Huso" . Collier's New Encyclopedia. New York: P.F. Collier & Son Company. ^ "Beluga Sturgeon Threatened With Extinction, Yet Caviar Quotas Remain Unchanged". Science Daily. March 4, 2008. "Huso huso". Integrated Taxonomic Information System. Retrieved 24 January 2006. Annex II of the Convention on the Conservation of European Wildlife and Naturaabitats. Revised 1 March 2002.